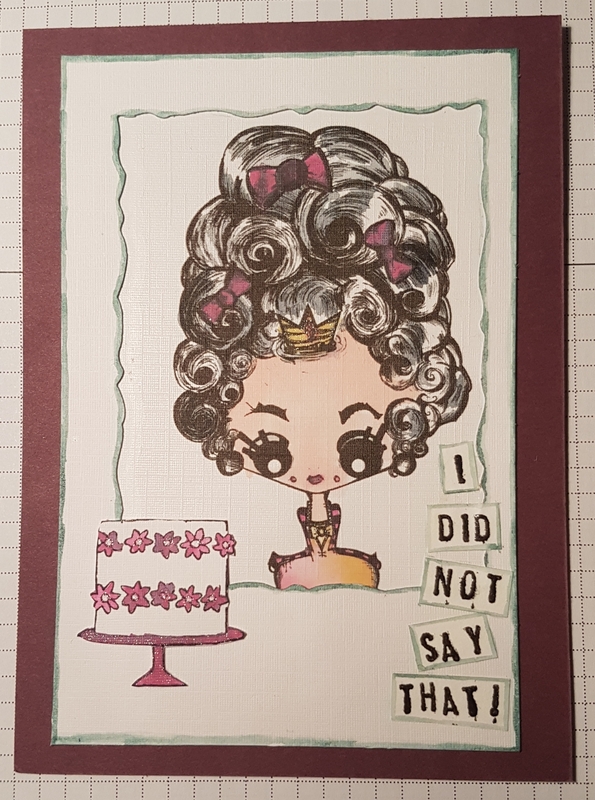 The theme for September in the Facebook postcard art swap group I am part of was “Let them eat cake, or bread” or “Marie Antoinette”. So I had to use the fabulous Marie Antoinette Octopode Factory digital stamp! Of course it is very unlikely that Marie Antoinette uttered the infamous phrase “Qu’ils mangent de la brioche” herself… in fact no proof at all that this was attributed to her… and that was why I went with the title I did for my postcard. I printed her off on the linen cardstock and then coloured her using distress oxides and my waterbrush. I then diecut a frame from another piece of the cardstock and sandwiched them together with glue. This was she looks like she it looking out of a frame. I added a little ink to the edges with a waterbrush to add some soft definition. Next I added a cake that I stamped and cut out from the Happy Moments stamp set. I did cut the candles off though and then added colour using the distress oxides and a waterbrush again. Next I added the hand stamped sentiment and edged that with the same colour ink as the frame. I then added the topper to a piece of Berry Burst cardstock that went well with the Seedless preserve distress oxide ink I had been using. Finally a little wink of Stella for Marie Antoinette’s crown and the cake flowers and stand to add that little bit of sparkle! Love it! And hopefully so will Sally-Ann, the recipient of the postcard.